It is difficult to know where to start and where to stop when it comes to giving handy tips if you decide to paint your own property. Yes, there is plenty of advice we could give you on a professional front, but often it is the little things that you pick up through experience that make for an easier life when you are doing your own painting. The following are 10 useful tips that we think will help you just that little bit and make the whole experience just that little more enjoyable. 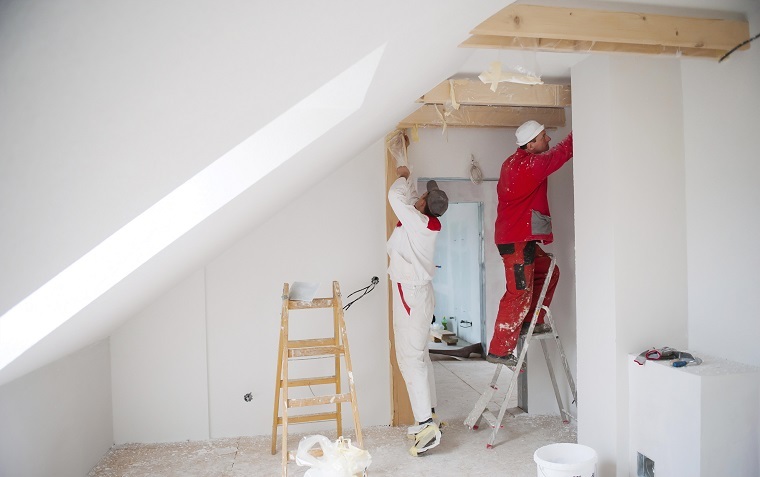 We also have for you an article containing 10 general tips when painting a property. Don't use paint straight from the tin. Good quality paint, especially trade emulsion, will require diluting by anything up to 25% with water. If you buy 5 litres tubs of emulsion paint, buy a cheap bucket and mix the paint and water in that. Buy some paint kettles. These are simple white containers with a wire handle that hold about 1.5 litres of paint. Use these for putting emulsion or oil-based paints in rather than painting direct from the tin or tub. That way you keep the tins clean and airtight. When preparing emulsion paint, it is at the right thickness if drops of paint that land on the surface rest for just a second before disappearing. If the drop remains higher for longer the paint is too thick and if it disappears immediately, then the paint is too thin. When applying emulsion to walls with a brush – usually at the edges where a roller can't reach - the paint should go on easily and smoothly rather than 'tug' a little. In addition, if you leave clear brush marks that don't flatten out when applying the paint, it is too thick. It is quicker to remove all ironmongery than trying to paint round it. A great painting job is made to look much better if there isn't paint where there shouldn't be paint. If you are going to be painting more than one room, and definitely painting ceilings, buy a paint roller and an extension pole to go with it – the pole will screw or slot into the bottom of the roller. This makes painting ceilings so much easier as you do not need to use a stepladder, and you will more than halve the time it takes to paint a wall as you can run the roller from floor to ceiling in one easy movement. If you intend to paint in the evenings and especially if it is dark outside so you have to use lightbulbs, buy a halogen lamp – roughly 500 Watts - as the extra brightness will ensure you do not miss any areas you are painting. Take your time over preparation – 80% of a good residential painting job is down to the preparation you do beforehand, not the paint you put on the walls. When painting with a brush, whether it is walls or woodwork, paint with long smooth strokes, not short dabbing strokes. This is especially important when painting windows and skirting boards as long smooth strokes will give a smoother finish and also eliminate the chances of paint runs. When using oil-based paints, they have a habit of 'pooling' in corners of panelled doors and will also run if you apply the paint too thickly. A good tip is to inspect areas you have painted every half an hour after you have painted it for up to 2 hours afterwards. This will allow you the chance to brush out any paint runs that have formed. Of course you could avoid all the hassle and bypass needing to learn all the tips to do a good painting job by filling in our simple form and requesting a few quotes from local painters instead.